Custom made additions to your home add a sense of grace you can’t get from just buying a pre-made item from a home improvement store. Custom gates and other entrances by DAS Studios can bring a unique ambiance to your home or business in central Florida. Not only will a custom gate from Tampa master carpenter Don A. Sigel serve as a good conversation starter, it will increase the value of your home and signal that you’re a conscious homeowner who takes good care of your property. Prospective patrons to your business will see an interesting and inviting space for them to shop, eat or relax. Take a look at one of Don’s custom gates below. Have an entrance to a garden or courtyard in your central Florida home, business or coffee shop that needs sprucing up? Contact Florida carpentry restoration specialist Don A. Sigel today for a free estimate. 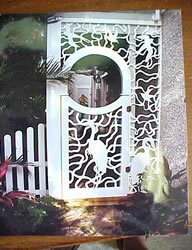 The pattern of this outdoor gate is a freehand, ribbon pattern with hand-sketched heron design by Don.